Like many other Himalayan tribes of the Mongoloid stock, the Gurungs celebrate and conduct quite a number of festivals and socio-cultural-religious rites and rituals. They seem to be influenced from the Nepalo-Indian calendar and make observers feel that Gurungs are wholly Hindus. However, this is just an indicative of the dominance of Hinduism where many indigenous Gurung festivals have been made facades for Hindu festivals, to further Hinduistic process or sanskritisation. In spite of this, the rituals and rites of the Gurungs actually have remote connection to the traditional rituals observed in the Hindu areas of Nepal or in India. Sometime, these are purely Gurung; only the names and their dates are borrowed from the Hindu tradition due to Hindu State policies. They may also vary from one village to another and from one household to another. Normally, major festivals are celebrated by the village or the neighboring villages together, whereas smaller rites and rituals are carried out at the village or household levels. An attempt is made here to describe some major life cycle rituals and major socio-cultural-religious festivals observed by the Gurungs. Gurungs consult astrologers when a child is born and three days after the birth, a naming ceremony is held. On the sixth day the Chhaiti is held. It is to be noted that a married daughter is not permitted to deliver at her parent’s house, since the afterbirth (placenta) fallen within the premises is considered an ill omen. If such a situation occurs then the afterbirth is buried behind the house in consultation with the Tamu priest or astrologer. A great banquet is organised and the night is passed in singing and merry making. Nine days after birth, pollution is observed for a male and seven days after for a female child and it is only after these days are over that the new mother is purified. The purifying liquid used is called gaunth or mahar kyu in Tamu language. This is the holy water and comprises of gold, ghee, honey, milk or curd and water which is basically the urine of a cow. This is sprinkled on the woman’s body and on this day the navran is held. This purification brings the woman back into the social circle and simultaneously welcomes the newborn baby whose name is announced on this navran. In the case of a male child, his earlobes are pierced and if a female, then her earlobes and nostrils are pierced. This is then followed by a grand feast consisting of various types of foods and liquors (home brewed and imported). Weaning ceremony or rice feeding or kain koba in the Tamu language involves the child being fed his/her first grains. It is also called the bhat khuwai or pasni. This weaning ceremony occurs five months after birth for female children and six months after males. The astrologer is consulted prior to this ceremony, so as to set up an auspicious time and date. On the stipulated date different types of foods are prepared and possibly some meat must be included. The child is fed first by a virgin girl as a symbol of good omen. Everybody present puts a white tika on the child’s forehead, feeds him or her with a little of the foods laid out and makes a present of some money or clothes (mostly money is presented). It is only after this bhat khuwai that children are permitted to wear shoes and new dresses. A feast for kin, kindred, neighbours and guests is also given. This ceremony is held only for the eldest male child and is said to mean that the child is reared in a very loving and obviously pampered environment. Putpute or pulple as it is known is held at the age of 2 years and conducted by the maternal uncle. The main theme of this ceremony is to offer worship to their patron god (clan god). The boy is blessed by the guests with gifts. There is much singing and dancing and the inevitable feast of foods and liquors concludes the ceremony. At the age of five, seven, nine or eleven, a Gurung boy has to go through a ritual called chhaewar or kra prehiba in Tamu language, meaning the initial hair cutting. The clipping of the boy’s locks must be done by his maternal uncle or if none exists another man is made his mother’s brother and this pseudo-maternal uncle carries out the task. A paindi, a Gurung astrologer is consulted for an auspicious day. The ceremony cannot take on an even month and even age. A boy is taken to a cowshed and part of his hair is cut off by his uncle (mother’s brother) by a pair of scissors and kept aside. After the ceremony the child is taken inside and put on white tika by parents and relatives, put on rupa and given a feast. For three days after the chhaewar, the child is not allowed to go outside the house, after which, leaving a tuft of hair, the rest is shaved off. After this ceremony, the child can participate in all the religious and social activities. The holding of a chhaewar ceremony indicates that the boy has become a socially, culturally and legally responsible person. He can now undertake all forms of social and cultural responsibilities that his community may demand. Just a chhaewar is held for a boy, a girl child is given ‘gunyo’ and ‘choli’ and also called nea bimba in Tamu after she completes her 12 years of age (lohokor in the Tamu). The gunyo-choli represents a woman’s dress and signifies the coming of age of a young Gurung girl. The community recognizes that she has now become an adult and is able to bear social and cultural responsibilities. On this occasion, she is told a story of life cycle, as well as duties and responsibilities of a woman towards the family and society. Called hya kai in Tamu, it means the songs of life or psalm of life. This song is an illustration of different natural and environment that signify nature and nurture. At the end of the ceremony a feast is organized in the village and she is warmly greeted by all. A Gurung marriage is clan exogamy and caste endogamy; one must marry outside his clan but within his caste. Marriages among the Gurungs are of two types: arranged marriage and marriage by elopement. Arranged marriage is done through a formal agreement between the prospective two families and in the second case, the couple elopes against their parents’ will. The traditional match for marriage is a cross-cousin marriage, where a boy marries his mother’s brother’s daughter (matrilateral) or the son marries his father’s sister’s daughter (patrilateral). A mediator plays the role of contacting either the prospective bride’s father and his lineage brothers or their own representatives. After receiving initial approval for the match from the bride’s side and having ascertained the horosocopic compatibility of the couple, the groom’s representative again approaches the bride’s side bringing a gift of liquor ‘pung’ and if this is accepted by the bride’s side, the match is formally assured and the betrothal is complete. The marriage of a Gurung is taken as a contract between a man and woman and not as ‘donation’ or ‘kanyadan’ prevalent among the Hindus, where a daughter from her birth is considered as a ‘paraya dhan’; somebody else’s property or a burden to the family. This is not so in the case of Gurungs where a daughter occupies an equally an important position in her maternal home and later in her husband’s house after marriage. The marriage in Gurung wedding has no religious significance. The ceremony is extremely simple. It marks the beginning of the legitimate conjugal life of a man and a woman. At the bride’s house, it entails putting on the white tika (rice mixed with curd) on the foreheads of the future couple and parents and relatives wishing them a happy life. They then wash their daughter’s feet and take a drop of water so used to their lips. Usually money is given to both the newly wedded couple by the parents and relatives. Similar ceremony takes place at the house of the groom. A wedding feast is a must during a wedding. In an elopement marriage, the above formalities are forgone and instead of parental arrangement, the boy makes known to the girl of his intention directly and if the girl is agreeable, both of them go into hiding. Message is relayed to the parents of the girl. In a few days time, he sends his representative (and he himself may go) to the girl’s father to reason with him and request him to accept the new relationship putting aside the offence to his dignity and to cancel other arrangements that he may have made. If the bride’s father agrees, the new son-in-law comes with gifts of compensation and a ceremony takes place to accept the wedded couple. Wedding ceremonies takes place usually only between mid-October and the beginning of April. However no rule forbids them taking place outside this period. To the Gurungs, dead is a serious matter and funeral assume exceptional importance in the eyes of the Gurungs. The death memorial rite is an elaborate three-day post mortuary rite in the name of the deceased. The Gurung death ceremony is a much more elaborate than those of any of the other ethnic tribes. The dead ritual of the Gurungs is very long and complex and performed in two stages – burial or cremation of the body and soul cremation which also indicates the end of mourning. The body cremation is called roho-waba and the soul cremation is called pae or arghun. The pae is performed for three days and nights by the Gurung priests of pachyu, gyabre and bon lama. It can start on the very day the body was cremated or after some days, months, year or even many years after. There is no specific stipulated time. The concept of completing a pae within 49 days is a Tibetan influence. To set an auspicious date and time the Gurung astrologer, paindi must be consulted. Pae is highly religious function presided by the traditional priests of the Gurungs and where animal sacrifices take place. During the pae the soul of the dead person is led towards the land of the dead. Lately, some Gurung are against animal sacrifices having influenced by the teaching of the Tibetan Lamaism which forbids any sort of animal sacrifices. The Gurung death rituals require the presence of their close relatives and they are clan members (Tahmai), family members (nehn mai), relatives from the maternal side (Ashonmai) and son-in-law and daughter (moho-chame mai). Many relatives of the dead person living in other villages also come to take part. All Gurungs wear a thread usually in yellow in colour, round their necks, called rupa or pahren ru in Tamu. It has nine strands and nine knots for male and seven strands and seven knots for woman in the name of nine and seven souls (plaha). It is significantly worn to ward of evil spirits, religious purification processes, and to basically thwart any general misfortunate on the person who wears the thread. The Tamu Lhochchar is the New Year for the Gurungs and it is celebrated by Tamus on every 15 Poush of Nepali calendar which falls on/around 30 December of the English calendar. It is associated with the natural phenomena and the morning sunrise on of 15th Poush is the New Year. It marks the beginning of the Tamu Sambat or Gurung Calendar year. Lhochchar also heralds the change in ‘Lho’. Gurungs divide time into cycles of twelve years (lohokor), to each year of which a special name is given, which is known as barga (lho). According to the oriental astrological system, there are 12 Lhos – garuda, serpent, horse sheep, monkey, bird, dog, deer, mouse, cow, tiger, and cat. So therefore, each year is marked by a particular animal and they are arranged in a single circle, following closely the Tibetan calendar with 12 animals. However, these animals may vary in the Tibetan Lhosar and Chinese New Year . The Lho returns after the twelve-year cycle. By knowing a man’s barga, his age can readily be calculated. Poush 15 heralds the end of the winter and start of the spring and traditionally it is celebrated by having ‘ban bhoj’ (‘shyo kain’ in Tamu), merry-making with, songs and dances and playing traditional games. These days, especially in major cities, all the Gurungs come together at a common place and celebrate the event by having various cultural procession, cultural programmes and feasts. The Toho Tehn festival takes place three times on Sundays in the month of Chaitra (March-April) and Shrawan (July-August). During these three days of holiday, people endeavor to chase away the evil spirits, carriers of sickness, from the village. When night has fallen, a group of boys between 11and 16 sacrifices a chicken and go successively into each Gurung house in the village with incense in a bowl. The children walk through the village making a deafening noise with drums, cymbals and bells, etc. to chase away the bad spirits who social evils, natural calamities, sicknesses and cultural erosion. After the indoctrination of the Hindu religion to the janajatis by the State, Dasain is a major festival for the Nepalese people, which is celebrated throughout out the kingdom for ten days. It falls usually in the months of Kartik (October-November). It is celebrated both individually and collectively. In the villages, agricultural work stops for four days. Ten days precisely some grains of maize are planted inside the house in a little earth and these young seedlings are worn behind the ears of the males and in the hair of the females during the festival. The house is cleaned from top to bottom. The white tika of rice mixed with curd is put on the forehead by the head of the family and he/she gives blessings along with some token of money. People then visit the houses of their relatives and older people to receive tika and pay respect. Children are happiest at this time because of the money they receive from their elders. There is much feasting among the people and merry making during this time. Lately, many Gurungs have stopped celebrating Dasain as they are slowly taking up either their traditional religion or Lamaism as their main religion. Dasain is a Hindu festival of the Aryans and it is not considered a Gurung or a Buddhist festival. Nevertheless, Dasain is still being celebrated in the villages as they have been doing since many generations due to cultural influence of the Hindus. As opposed to the Hindus, Gurungs put white tika and the Hindus red tika on their foreheads at such functions and other auspicious occasions. The third day is a day of honouring and respecting sisters by brothers, and is called Bhai Tika. On this day, a sister puts on a tika of rice and curd on her brother’s forehead, and is given a good feast. The brother in return gives present to his sister either in cash, clothing or other items. There is much feasting and merry making like in during the Dasain. A main feature of Tihar is the Bhailo or deusi which are participated enthusiastically by all, children and adults alike. They go around singing and dancing from house to house asking for money, which could be used for a good social cause or enjoyment purpose later such as picnic. Although Tihar is very much a Hindu festival as well, Gurungs celebrate it because they believed sisters have to be honoured and respected. It is shows the extent of influence of the Hinduism and how it has interfered with the culture of the various indigenous people of Nepal. Sildo thiba is basically the worshipping of natural deities and to show respect and honor towards gods and spirits that protect the village. The name sildo-naldo could be analysed in the following way: ‘si’ means ‘rice grain’; ‘na’ means ‘rain’; and ldo is the verb ‘to do’ (la-ba). Sildo-naldo thus means the divinity that ‘made the grain and the rain’. It is done five times in a year in Chaitra, Jesth, Bhadra, Asoj and Kartik, on a Tuesday nearest to the fullest moon. A Gurung priest (pachyu) performs the prayers in front of an altar and asks the sildo-naldo to protect the village. Ten cones of rice are made, out of which one of the largest symbolises sildo-naldo. Offering is made in grains and an animal sacrificed at the end after the prayer. Gurungs worship many gods, goddesses, as well as their divine ancestors (pitree and kul). Hindu deities are also included in their pantheon. The pachyu, gyabre as well as lama are used for religious rites and rituals which basically indicate that Gurungs follow a mixed religion consisting of animism, Buddhism, Hinduism. Gurungs are traditionally well known for their humour, valour and singing and dances and therefore fond of merry making and enjoyment. Singing of Dohori geet (song) are very poplar among the Gurungs. It is a folk tune sung in duet between males and females at fairs and festivals, either as part of competition or just as a form of entertainment. In the earlier days in the villages, it used to can carry on days on end if the competition did not end and when it ended, the loser had to surrender one self to the winner. But these days, this custom is not practiced but singing of dohori geet is still very popular among the Gurungs, accompanied by dances. It has been so widely promoted that these days that dohori songs are sung in a commercial environment in restaurants and hotels. This negative practice has damaged the image of the Gurungs along with its traditional costumes. The Ghanto nach or dance festival takes place in the month of Magh Panchami in Magh (towards end of January) and ends on Baisakh purnima which falls around the end of April or beginning of May. This final performance lasts from morning to evening for three days. Not a single episode must be omitted; if a mistake is made it is believed that the dancing girls will become sick and may die. Young girls around the ages of 12 (pre-pubertal) perform the ghanto and are called ghansaris or ghatonis. They wear typical ghanto dress comprising of traditional Gurung dress, jewellery and special headgears. They dance trance-like and it is extremely graceful, twisting, rising, and sinking and then turning in a squatting position with the hands just touching the ground, with eyes closed, in a story that is sung by a group of men, a slow chant to the rhythm of a double-ended drum. The language of the ghanto chant does not appear to be either modern Gurung or Nepali, perhaps archaic Nepali. It is even unintelligible even to the ghanto gurus who can only say what each part is about generally. The story tells a long story of a legendary King Parsuram and his queen, various events in their lives including the death of the king and the immolation (sati) of his queen and her subsequent return to life. This is the most important part of the ghanto. It is said that if a ghansari cannot be resurrected after she swoons when the part about the self immolation is sung, then she is liable to die. The rest of the story depicts a long and eventually successful hunting venture followed by a gambling spree. There are two types of ghanto dances that are performed are the sati and baramasye ghanto. The former is performed at a fixed time as described above, whereas baramasye can be performed at any time and is not rigid following strict adherence as the sati ghanto dance. A distinctive Gurung institution, ghanto is fading away, as the old men who sung the songs die; young girls have less time from their school work; and the rich soldiers who paid for performances no longer come to the village. Yet, one can still find ghanto being performed in Lamjung and Gorkha districts. A sorathi dance is a typical Gurung dance which is a re-enactment of an ancient legend about a king who had 7 wives and no children. It relates the story of the youngest queen who at last bears a daughter and the other queens out of jealousy hatch a plan to murder the child. The child is thrown into the river but gets saved by a fisherman who rears the child as his own. At the end, the plot is revealed and the mother and daughter are reunited while the guilty ones are punished. 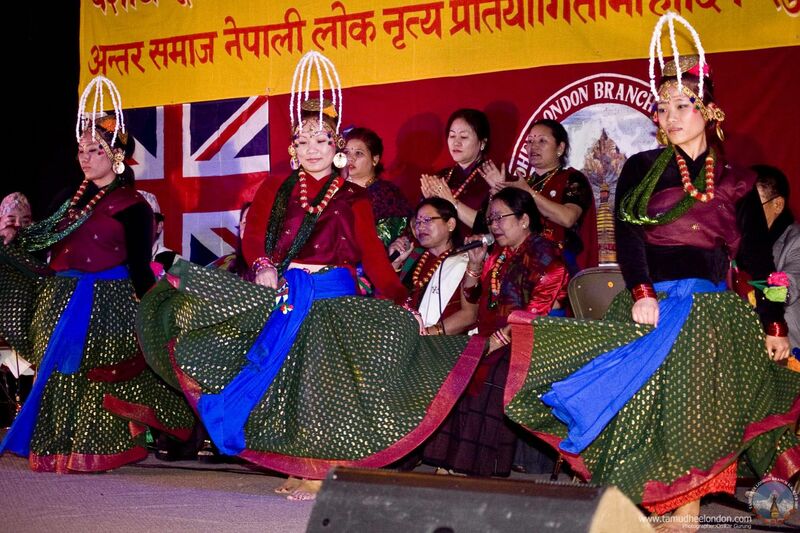 This dance is held for sixteen days and falls between Dasain and Tihar. Maruni dance is one of the traditional dances of Gurungs performed in the month of Shrawan (July-August) and lasts up to month of Poush (December-January). Various Hindu male and female deities are worshipped and offered ten varieties of flowers, among which, one kind of the flower is set aside for Goddess Saraswati of arts and learning. At the end of the dance, the flower is offered to the Goddess and tika and presumes to receive blessings from her. The dancers’ bodies move in a peculiar but yet exhilarating grace in their own traditional costumes, the rest of them play mandal (drums) and sing in high falsettos arousing feelings from everyone present there to watch the dance. The dance is near to extinction and efforts are being made to revive and preserve it, especially by the Ghale Gurungs from Barpak of Gorkha. Generally Gurungs enjoy merry making and usually such socio-cultural-religious functions provide opportunity for entertainment and interactions among all the villagers of all ages. They especially serve as meeting points for the young Gurung youth as some of these functions take the shape of melas/fairs lasting from a day to several days. The young people interact freely and get to know each other, enjoy each other’s company and also choose their life partners. Sometimes love affairs may result from such encounters. Pignede, B. 1993 The Gurungs. English Edition. Ratna Pustak, Nepal. Andors, Ellen. “The Rodighar and its Role in Gurung Society.” Contribution to Nepalese Society. Vol. 1, No. 2, June 1994 (pp. 10-24).